What better and more classic was to save space in tight bedrooms than a bunk bed? If you need more space than a twin bed can provide, and two kids have to share the same space, then bunk beds may be the perfect option. If you have the right materials and tools, you may even be able to stretch your buck a little further by building the bunk beds yourself. If you’re feeling up to this task, here is how you can build bunk beds. Continue reading to find out how. Decide what size mattress you will need to use in the bunk beds.This is important in terms of space. Construct a box by using 2×6’s. They should be 78 inches in legth and 41.5 inches in width. Countersink the holes in the boards wood plugs. Put the mattress supports together inside the box. Use four 41 ½ inch 2x4s .Move in three inches from the head of the bed frame. Place a support here. Move in 25 inches from the foot of the frame and place a support here. Place the final support 48 inches from the foot of the bed. Countersink all holes made by screws with wood plugs. Secure with screws on the ends. Use carriage posts to join the corner posts to the boxes. Place the lower bunk at least 12 inches from the floor. The top bunk need to be at least 48 inches from the floor. Use #10 finishing nails to attach the frame to the posting. Check that they are square before adding carriage bolts. Make the guard rails from 2×4’s by making forming a box. Install guard rails inside. Build mattress supports with two cut plywood sheets. They should measure 38 ¼ inches x 74 ¾ inches. Put them inside each frame. Do not nail or screw. Cut two 2×4’s 57 ¾ inches in length. At the top of the wooden boards construct it with an angle. This positions the ladder to fall into the bunk bed frame. Install rungs. Use five 2×4’s cut into 14 ½ inches in length. Place the rungs on the ladder 12 inches apart. 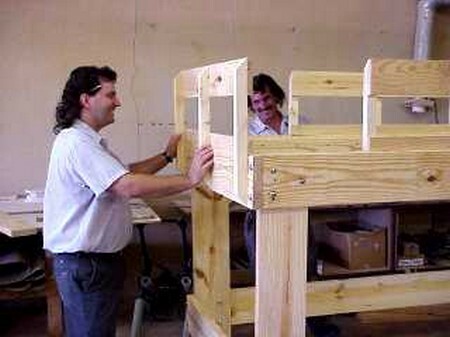 Place the hook on the upper part of the boarding.Use lag bolts and place the ladder on the top of the guardrail. Add non slip padding for safety. You can even place some at the bottom of the ladder. Sand the bunk beds and finish the set. Countersink any nail holes.